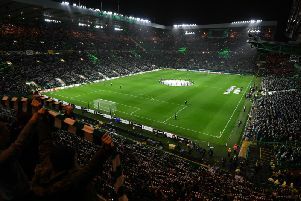 Bookies have dramatically slashed the odds on Newcastle United manager Rafa Benitez taking over at Celtic in the summer - after a flurry of bets on the Spaniard. Ladbrokes admit they’re bemused by the activity, which saw a series of bets placed on the ex-Liverpool and Chelsea boss, shortening his odds from 20/1 on Tuesday morning to 5/1 barely 24 hours later. David Moyes revealed today that he is keen on becoming the Hoops’ new permanent manager, but the former Everton and Manchester United boss remains on 7/1, just ahead of recently-departed Huddersfield boss David Wagner and Kilmarnock manager Steve Clarke on 10/1. Red Bull Salzburg boss Marco Rose, who hinted at an exit from the Austrian side earlier this month, is still priced at 6/1 while Belgium boss Roberto Martinez - who has previously held talks with Celtic about the managerial role - is second favourite on 4/1. Current interim boss Neil Lennon remains the favourite with odds of 10/11. Preston boss Alex Neil, Aberdeen manager Derek McInnes and Celtic legend Henrik Larsson are all priced at 12/1. Like former Bhoys boss Brendan Rodgers, Benitez has history at both Liverpool and Chelsea, and has also had spells in charge of valencia, Inter Milan, Napoli and Real Madrid. He led Liverpool to UEFA Champions League glory in 2005, winning the FA Cup the following year. The Coppa Italia and Supercoppa Italiana were won in 2014 with Napoli, the season after Benitez won the Europa League with Chelsea. His most recent honour was winning the Championship flag with Newcastle in 2017 as they earned promotion back to the Premier League.